Japan’s attempts to assemble an anti-China coalition in the region are dangerous and misguided. Indeed, last month Japan announced that it would provide patrol ships to the Philippines to enhance its capabilities against China. Then, in a speech last week in Singapore, Japanese Prime Minister Shinzo Abe said that Japan would like to play a leadership role in Asian security and help countries like Vietnam who have territorial disputes with China by offering patrol ships and other military equipment. Japan’s defense minister also met with Vietnam’s defense minister in Singapore to discuss cooperation against China regarding their territorial disputes. Moreover, Japan hopes to cooperate with like-minded countries like Australia and India to curb China’s assertiveness in Asia. These moves underscore that Japan is attempting to build an anti-China coalition against the backdrop of the relative decline of the U.S. and a rising China. Worried that it would not be able to compete militarily with China, Japan hopes to assemble an anti-China coalition by building military alliances with countries that have territorial disputes with China. While it might sound rational from Japan’s perspective, this idea of an anti-China collation is dangerous for regional peace and stability and will ultimately hurt Japan’s national interests. This strategy will generate two very negative consequences for regional peace and stability in Asia. First, by providing patrol ships and other advanced military equipment to countries like Vietnam and the Philippines, Japan is essentially encouraging these countries to initiate or escalate conflicts with China. In China this is called “火上浇油 (adding fuel to fire),” and it is not a wise leadership strategy. Vietnam and the Philippines might be emboldened by Japan’s help and miscalculate their chances of winning disputes with China. Indeed, given the huge gap between their military capabilities and China’s own military capabilities, any miscalculation might lead to grave mistakes that hurt Vietnam and the Philippines immensely. For example, what would Japan do if a war breaks out between China and Vietnam? Is Japan willing and capable of sending troops to help Vietnam against China? Any rational decision maker in Vietnam would not bet on this possibility. If Japan truly wants to play a leadership role in Asia, it should work as an honest broker among all parties to identify opportunities for de-escalation between China and its neighbors. Secondly and more importantly, Japan’s strategy to build an anti-China coalition will essentially force China into a corner, as China would conclude that Japan aims to stop China’s rise by encircling it. The right strategy for Japan is to refrain from backing China into a corner. Cornering China is a very dangerous move as Beijing is still very much a defensive power mostly concerned with its own regime security and various pressing domestic problems. As Andrew Nathan and Andrew Scobell point out, China is still “a vulnerable nation surrounded by powerful rivals and potential foes.” This means that China is not an expansionist power as many in the West and Japan fear, thereby suggesting that a more engaging approach to China would be more prudent. China is already too large and too powerful to be contained, no matter how hard Japan attempts to build a coalition against it. China’s military spending is now twice as large as Japan’s military spending; and the gap between the two will only increase as Japan’s economy continues to face uncertainties. As to the territorial dispute between China and Japan, the best strategy for Japan is to acknowledge it and refer it to international law, or shelve it for later resolution, as a number of international and Japanese observers suggest. Although this prudent strategy would face strong domestic opposition, Japanese leaders must overcome such opposition because it is in Tokyo’s long-term interests. Despite strong warnings from U.S. government officials, Japan made a serious miscalculation when it nationalized the Diaoyu/Senkaku islands in 2012, which resulted in China’s sharp response and later a co-administration situation over the Diaoyu/Senkaku Islands, which is a victory for China and a loss for Japan. 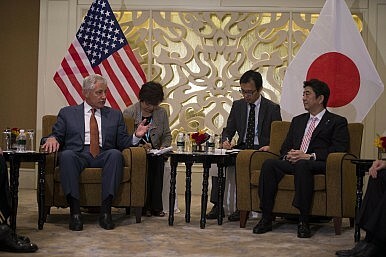 If Japan makes another grave mistake by encouraging states like Vietnam to form an anti-China circle, something worse would occur to Sino-Japanese relations and Asian stability and peace. Let us hope that wiser heads will prevail in Japan. U.S. B-1B bombers and Japanese fighters participated in a joint air drill in the vicinity of the Senkaku islands on August 15. China's Maritime Great Wall in the South and East China SeasChina Has Much to Gain From the South China Sea RulingChina’s Maritime Disputes: Trouble to the South, but the East Stays Quiet A New Way to Resolve South China Sea Disputes?Are We Prepared for 'Hybrid Warfare'?